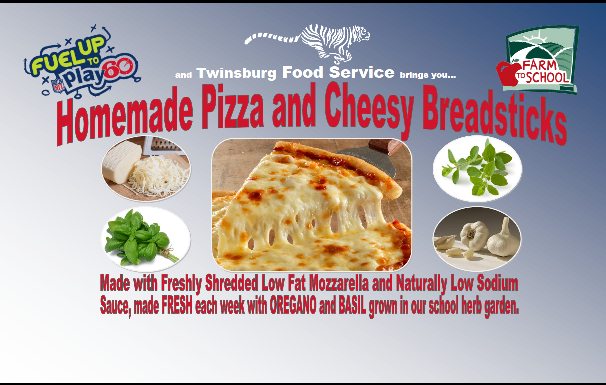 All of Twinsburg’s schools are USDA certified as HealthierUS Schools! We are part of only 4% of school districts nationwide that exceed all current USDA guidelines for food served in our schools. We always strive to serve food that is fresh, healthy, and appealing. This year we continue to break new ground by utilizing a Farm to School Grant that we were awarded to grow our own basil and oregano in our district to be utilize for our tasty, low sodium, homemade pizza sauce. In April 2015, Twinsburg City Schools partnered with the NFL and Fuel up to Play 60 to start Tiger Breakfast Rewards. Students were encouraged to eat breakfast at school and when they did they were eligible to win some very cool monthly prizes. Area business donated many of the prizes for 7th-12th graders (Chipotle, Fun ‘n’ Stuff, Sheetz and Dairy Queen), while the Fuel up to Play 60 grant provided funds to purchase promotional signs and other prizes for grades K-6. 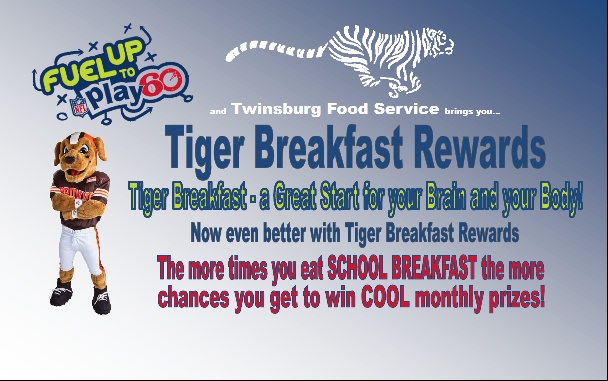 Today, we are still operating our Tiger Breakfast Rewards for grades K-6. Our top two breakfast participants from each school are selected as winners of a cool prize each month!